Ordering your high school transcript electronically is quick and easy to navigate. Parchment can send your transcript to any destination worldwide. Please follow the instructions below to create an account and order your transcripts online. For quick details, download the Student Flyer. Select your High school. Enter "Laguna Beach High School" and select "Search". Select your destination and complete the information. Academic Destinations includes a college, university, NCAA or Common App, accessible in "Academic Destinations", "Other Destinations", "Yourself", "Other individual"
Please have a credit card available when submitting your transcript request. Parchment fees may vary depending on delivery method and handling change selected by student/parent. A parchment fee of $3.50 per transcript should be expected. The common application only requires a $3.50 transcript fee each time to be linked to all colleges listed on the student's application. All transcript order requests can be made through the parchment service. Please remember that Laguna Beach High School has your transcript. 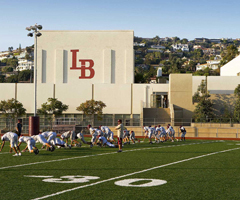 Parchment is a provider service that will notify Laguna Beach High School when an order is placed. That order may be delayed due to special circumstances and/or all Federal holidays. Please allow two (2) regular business days for processing any electronic records. If your transcript is not electronically available, Laguna Beach High School will process your request and send your transcript within five (5) to ten (10) regular business days. To request your transcript during regular business office hours in person please have the following information with you. IMPORTANT – The student's counselor cannot submit the Secondary School Report until the student has ordered his/her online transcript through Parchment. The directions below are for students who are using the Common Application and the school counselor intends to submit the school forms online. Student will create an account at www.commonapp.org and note the Common App ID. Student must invite his/her counselor and teacher to be a recommender. This will generate an email via the common application to the counselor and teacher to complete the Secondary School Report forms online. When the Common Application has been completed, the student will sign in to his/her Parchment account and select "Common Application" as the destination for the transcript. The student will enter in the Common App ID number that was assigned to the student through the Common Application. Parchment will deliver the student's transcript directly to the Common Application where it will be matched to the student's school forms based upon the Common App ID number. Once the transcript is linked, the transcript is ready for all submissions to all of the student's Common Application Colleges. The student does not need to submit one for each "C" college.